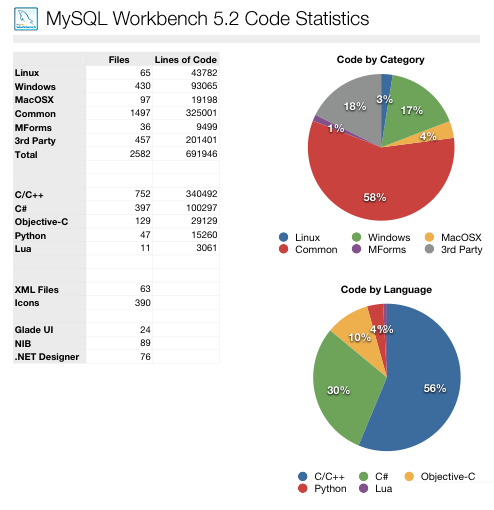 A community member recently noted, that it takes quite a long time to compile MySQL Workbench. So he started wondering about how big the project actually is and asked for the Lines Of Code we have in our MySQL Workbench 5.2 repository. We did not have this information at hand and therefore Alfredo ran some scripts during the weekend and generated this nice breakdown. As you can see, we almost have 700k lines of code to maintain. Given that the MySQL Server itself has about 900k lines of code this is a pretty decent number I think, especially for a small team of 7. It seems like the windows code is way more modular. Do you know why the windows code is twice as big as the linux code? MacOSx is really small compared to those. 700k loc, wow, I didn’t expect that.